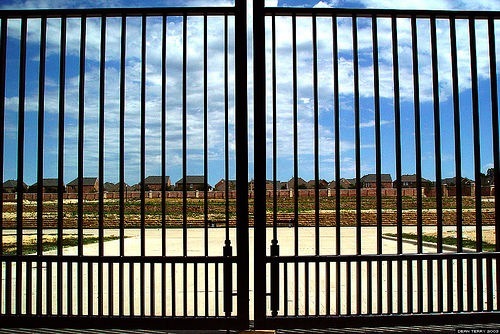 Is Your User Group a Gated Community? Recently I was listening to a radio program and they started talking about gated communities, what they were and how they functioned. While I was listening I started thinking about my user group and asking the question “Has my user group become a gated community?”. Have you ever gone to a meeting, for anything, and thought that you didn’t fit in or felt like it was going to take a lot of work to be accepted by the group? You may have just encountered a gated community. We have all seen them, right? The big fence surrounding a bunch of usually really expensive houses with only one way in. Oh, and you have to be invited, on the list, and have to check in with the gate keeper to verify all information before allowed in. Why would you want to live in a gated community that required all of that? People want to live in a gated community to feel safe, keep people they don’t want to be around out, and the ones they do want to be around in. Many gated communities, especially the larger ones, have all the amenities and rarely require residents to leave. This has become a type of enclave, Seth M. Low, among other anthropologist, has argued that gated communities have an negative affect on the community outside. I would agree that this does the same for people outside of your user group. Here are a few items I think might be indications that your group is a gated community. This is, of course, is my opinion so please take it with a grain of salt. With this post I hope to start the conversation with the community to better understand and solve this issue. If you think of any other please let me know. I am just starting to think about possible ways to open this up. We need a way to make first time visitors feel welcome, without it feeling forced. It must be genuine. Have new/first time visitors introduce themselves at the beginning of the meeting. I am sure there are not any user groups or technical community that actively seeks this condition. It can happens slowly over time, especially if you aren’t watching for it. This condition is also not exclusive to small user groups, it can happen at work, and even in larger national organizations. Once the problem has been identified the hard part begins, trying to figure out how to solve it. Currently I have more questions than answers, and am greatly interested in hearing how you handle this issue in your community. Please email me at jay@jaysmith.us or post a comment to this blog I would love to hear your input. I received this book from INETA several years ago and it has been one of the most useful resources on building and growing community I have ever read. I keep coming back and re-reading it every year, and every time I learn something new. Dr. Greg Low does an awesome job of giving very sound advise and practical approaches to many issues faced by communities. Topic covered in the book include why to start a technical community, finding speakers, how to start and grow user groups, recruiting members, how to organize your meeting or conference, and tips for presenters. There are also two whole chapters dedicated legal and finance, and funding. 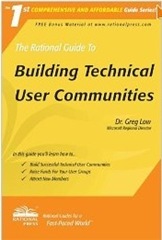 If you are a user group leader, or have thought about starting a user group this is a must read. I highly recommend it for anyone that is a leader of a user group or technical community, presents to communities, or just a community member. If you see me at a conference ask me about this book, you might be surprised at what happens. Last time we learned about the Opening Circle, this time we are going to focus on what happens for most of the day, the actual open space session itself. 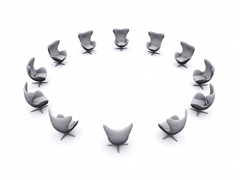 You may remember from the post about The Opening Circle that someone has to stand up and propose a topic or idea to be discussed in a session and by doing so has agreed to be at the chosen place and time to discuss and share on that topic. This however does not mean that anyone will show up. Devlin and I placed a topic on the board at devLink 2009 this fall to discuss the usage of the Wii Remote in .NET Applications. We had 2 people show up. This was still a successful session; we discussed with them what we had learned. The 2 people that did show up weren’t even aware that you could use a Wii remote with a .net application. So we shared with them what we knew, and in the discussion we got some great ideas from them about other ways to use it. The success of a session is not determined by numbers but by learning or sharing. What do you do when people show up? So, you have your session on the agenda, your time slot is about to start, what do you do? Simple, you wait to see if anyone else joins you, when the time hits you re-iterate what your topic is, ask someone to take notes start the discussion. There is usually a flip chart available for capturing topics of interest. The group is then in charge of where the conversation goes and how long the discussion last. A session is usually allotted 45 minutes, especially if this is running along side other conference sessions. This will allow people to go to an open space and attend regular sessions. But remember, just because the time is up on an open space discussion doesn’t mean that the discussion should stop. If your time is up and you have not exhausted the subject, move the discussion to another location and continue. This will allow the next discussion to get started at the scheduled time instead of having to wait. What do you do when people don’t show up? If no one shows up, don’t let the opportunity pass you by. Think of it this way, you have the complete timeslot to use to explore the subject on your own. As long as you are learning it is a success. Remember who shows up is the right people or person to show up, in this case you are the right person so go for it. I know this post is a little short when compared to the others, but but believe me sessions are anything but short on content. This is where the real magic of the self organized event takes place. This is where solutions are crafted, discussions are heated, and relationships are forged. This is what the event is all about, you and what you are passionate about. I love the organic feel of an open space session, leaving breathing, flowing like a Zen master. In the next post we will look at the Closing Circle activities. What do you do when it’s over? I will also discuss what you can do with all those notes that got taken during the sessions. 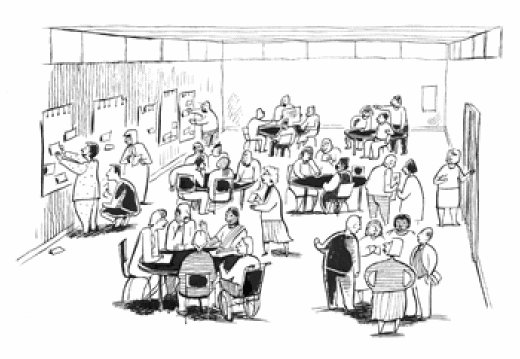 This is part two in a multipart series discussion Open Space Technology. Last time we looked at the 4 Principles and the 1 Law that many attribute to the success of Open Space Technology. Today we are going to look at the Opening Circle and the Market Place. At the beginning of an Open Space the participants sit in a circle. A facilitator is responsible for greeting all of the participants and reminding everyone of the purpose, principles and the one law. Participants are then invited to identify any issues or topics they feel should be discussed. This process doesn’t take long and it is amazing to see how a group can come to order so quickly in this format. While attending devLink 2009 and eagerly awaited Alan Stevens to kick off the opening circle I noticed that everyone was talking have have a great time. Alan walks into the circle, doesn’t say a word, just starts pacing in a circle. Amazing, within a few short minutes everyone stopped talking and started focusing on Alan. Once the room was quiet Alan kicked it off. It was amazing to experience, if ever get a chance to go to an open space facilitated by Alan Stevens go, he is excellent. As I stated earlier, the opening circle is where everything is explained the 4 principles and the 1 law and generally sets the tone for how the rest of the open space is going to flow, communicating schedules, needed resources, closing circle, etc. Once the general flow is communicated it comes down to setting the schedule, I mean we all want to know what we are going to talk about right? ;-). That is where the Market Place comes into play. The Market Place is a blank schedule showing times and rooms but no topics. 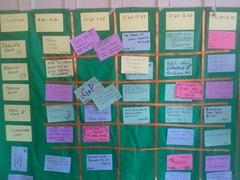 The facilitator encourages the participants willing to raise a topic to come to the center of the circle, write it on a sheet of paper and announce it to the group before choosing a time and a place for the discussion and posting it on a wall. That wall becomes the agenda for the meeting. No participant is forced to suggest issues/topics, but anyone may do so. The person who posted the topic is responsible for being at the session at the chosen time and place, start the discussion, have someone take notes and post them on the wall when the session is over. It is important to note that this is not a speaker lead session; it is a discussion had by everyone that shows up to talk about the given topic. When all time slots have been filled, participants sign up to attend sessions. Wow, that is a full day of topics organized in about 30 minutes; this is the definition of self organizing. Once the schedule is finished the Open Circle is done and participants start breaking up to begin the first sessions. The Opening Circle and the Market Place is where the Open Space Technology really shines. This is where the attendees create the list of topics THEY want to talk about and decide WHEN they want to talk about them. I one or two day conference can be organized in about an hour with very little input from the facilitator. When I describe this to some they say, “But you will only get the passionate people to come and suggest things”, to which I reply, EXACTLY. That is the point, you want the passionate people to be there, you want them to bring up topics they are passionate about, and you want others that are passionate about it to get together and discuss it. If you are not passionate about it and aren’t getting anything out of it or contributing anything, why are you there? The opening circle is where the attendees take control of the conference by suggesting topics that they want to talk about that they feel they will get the most value out of. It is an awesome, organic feeling to know that, YOU, has an attendee have that much control over something you want to attend.